This is no ordinary cheesecake. 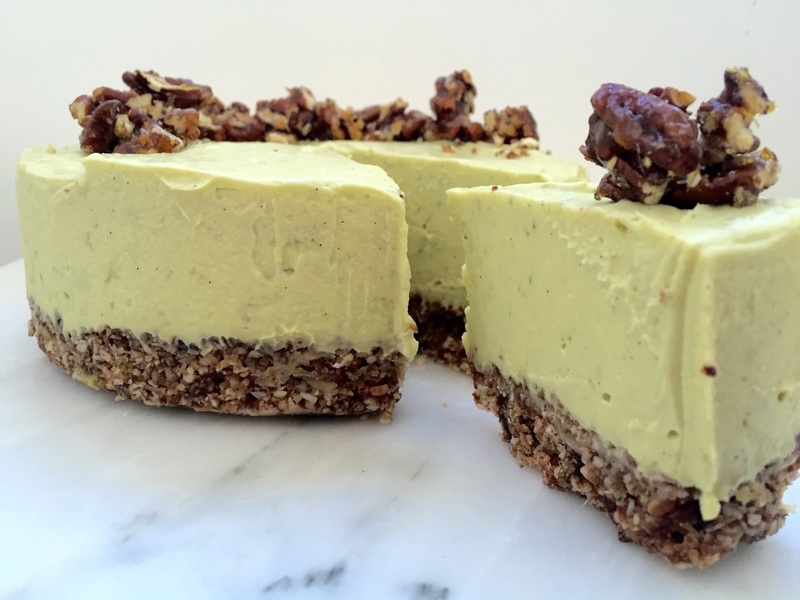 It is a healthy, deliciously smooth, dairy, gluten and all the extras free cheesecake. Created by a favourite blogger twosome, Hemsley Hemsley. These fashionable foodies are food bloggers for Vogue and over the past few years have shot to stardom and made spiralising all your veg into a carb substitute the thing to do. They also have thier own spiraliser, take a look at it here.. This is a dessert that you can serve to your guests who need such dietary requirements or just as a guilt free pud for those nights you want to tuck in and enjoy with a happy, healthy, bloat free tummy afterwards too. I used a recipe from the Hemsley sisters book The Art Of Eating Well, inspired by their supper club I went to a couple of weeks ago. Start by grating the rind of all your limes and jucing them, the more the better and the zingier your cheesecake will be. Set this to one side and get started on the base of your cheese cake. Sprinkle a layer of desicated coconut onto a baking tray with your pecans (set aside a few for your topping) and let them toast untill golden. Now mix all of this into a blender with around 30 dates and 2 to 3 tbps coconut oil. Now place all of this in the bottom of a greased bottomless 8in tin and place in the fridge. Next pour the juice in a blender with your peeled avaocados and wizz till smooth. Add a good dollup of vanilla bean paste for taste and pour the mixture over the base. Smooth out the top and leave to sent in the fridge for about 2 hours or untill set. Now with the remaining pecans make up a brittle to be sprinkled over the top of your cheescake. 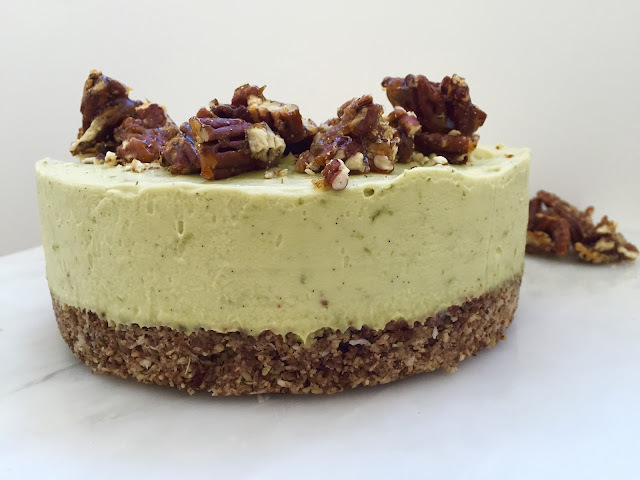 This makes the dessert that little bit extra spacial and also adds fantastic crunch. To make this mix a cup of soft brown sugar with 1/2 cup of water let this bubble away in a meduim sauce pan for about 5 minutes. Throw in your pecans and pour out onto some baking parchment to allow to cool. Leave to cool and set for about 30mins to an hour and then break up and spinkle on top and around the base for decoration. 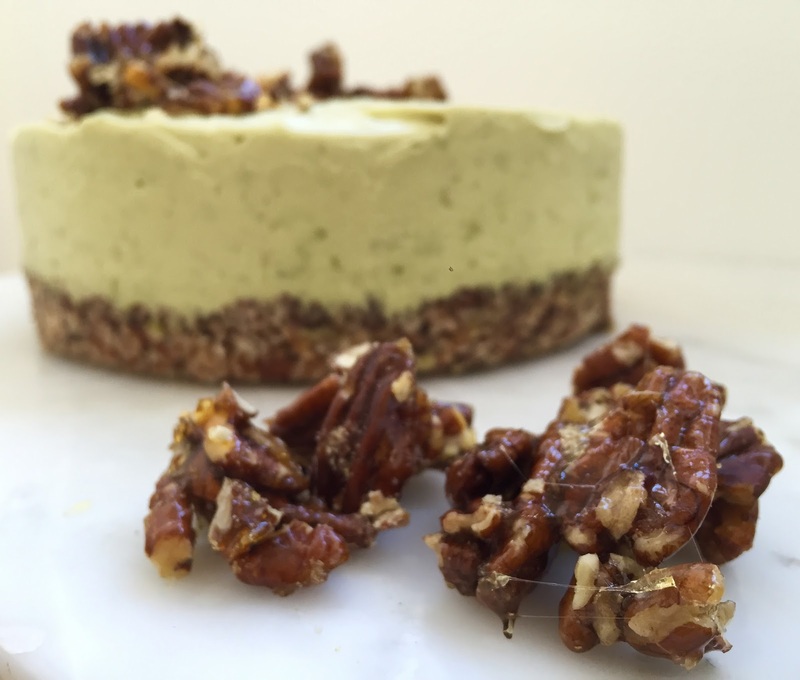 A really delicious way to add something slightly naughty to this healthy cheesecake!